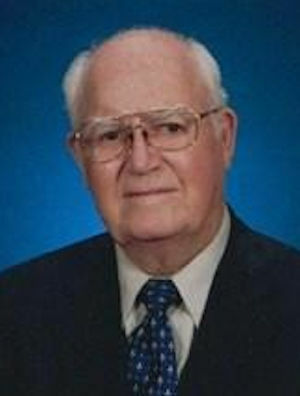 Obituary – Kelley, Howard Lindon « Perry High School Alumni Association, Inc.
– son of Mr. and Mrs. O. L. Kelley, was born August 23, 1919, in Prescott, Arizona. He has attended school in Norman, Clinton, Guthrie, Vinita and Perry. He is a member of the State Honor Society and the National Honor Society. He had a part in the freshman operetta and was salutatorian of the ninth grade. He is interested in engineering and is planning on attending school next year. Howard Kelley was born August 23, 1919 and died July 15, 2012. He met and married Leona in Oklahoma City, Oklahoma and they recently celebrated their 70th anniversary in the Lord. Kelley was a WWII veteran, graduate of University of Oklahoma, and a professional engineer. He retired from National Production Systems as Senior Engineer in oilfield equipment. He served as an engineering consultant and was on the staff of UTA and Kilgore College as an instructor in Short Course Oil Technology School. He served in 3 different churches as a deacon, elder, chairman of elders, financial chairman, and committee chairman of building and grounds. He is survived by his wife, Leona, his daughters, Linda Joekel and Carol Francis, son in law, Stanley Francis, his grandchildren Ethan Francis and wife Julie, Angela Strong and husband, Brett, Jonathan Francis, Aaron Francis, and Ken Joekel and wife Gwen along with his great grandchildren Ben, Ayla, Tyler, Hunter, Luke, Ryan, and Eric, and his brother, Calvin Kelley. The visitation will be from 6-8pm Tuesday, July 17, at Grove Hill Funeral Home. The funeral service will be 10am Wednesday, July 18, at Lakeside Baptist Church, 9150 Garland Road, Dallas, TX 75218, followed by a graveside service at DFW National Cemetery at 1 p.m. In lieu of flowers, donations can be made in honor of Howard Kelley to education ministry at Lakeside Baptist Church.